Are you ready to track down some fun events for Halloween 2018? We have put together one of the largest calendars of Halloween events in the United States for you.It locates holiday activities for all ages – from kid-friendly children’s activities to adult Halloween parties. 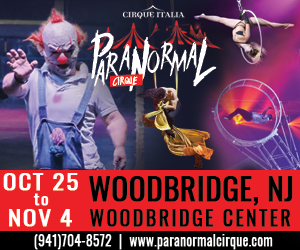 We don’t have every event yet, but there are plenty of ideas to get you and your family in the mood for Halloween in New Jersey. Held at the Emlen Physick Estate. Once again, the grounds of the Physick Estate will be transformed for a spooky Halloween, and Scarecrow Alley showcases homemade scarecrows — from the ghoulishly gruesome to the foolishly funny! 5K Halloween run, Kids Pumpkin 1 mile challenge, first timers 5K and 1 mile family walk. Under this Clown Castle, the black and red big top tent, Acrobats of the Air, Illusionists, freaks, mysterious creatures and all the elements that make one think of a “normal” Circus but that of normal has very little! A new show with breathtaking implications always poised between fun and the most uninhibited fear that will transport you to a dark world inhabited by creatures with incredible circus art abilities. A crazy yet fun fusion between Circus, theatre, and cabaret in perfect harmony with the evolution of a show that brings you back to when we dream … and when we had nightmares and fantasies. Scare, encompass, amuse and surprise are the ingredients for a mixture of emotions impossible to forget. This is truly a Paranormal experience like no other. This show is rated R for adult language and material. You must have ID showing you are above 17 when buying a ticket, and all guests 13-17 must be accompanied by an adult 21+. Visit Tuckerton Seaport, if you dare, for a frightastic adventure known in local lore as Haunted Seaport. Haunted Seaport will take place on Thursday, October 18, Friday, October 19, and Saturday, October 20, and Sunday October 21 from 6:00pm until 9:00pm each night (last admission will be at 8pm or earlier dependng on capacity). Pirates and Sea Captains long lost at sea will stroll the Seaport’s boardwalk for a night of screams. The parade features a wide variety of eye-catching costumes, floats, musical entertainment and mascots. Parade Route: 45th Street – JFK Blvd. & Landis Ave. Dance Party Immediately following parade at Excursion Park. Bring your family, including your pooch, to O’Connor Park for a dog parade and costume contests, with prizes for overall “top dog,” best pack/family, most creative, most Fur-ocious, best couple (dog and owner) with proceeds benefitting the West Orange Animal Welfare League. Two weekends of fun. Trick or treating, crafts, games and pumpkin patch. Why has the Medford-Vincentown Rotary put on this fantastic parade year after year? All you need to do is walk down Main Street and see the hundreds of kids all dressed in custom and excitedly waiting for the first float to come by. It’s a magical night that brings the community together and has grown to attract well over 20,000 spectators and participants. With marching bands and cheerleaders, princesses and fireman the Medford-Vincentown Rotary Halloween parade is a family friendly site to see. One of the oldest Halloween parades in NJ. Some spooky characters are waiting on the grounds of the Emlen Physick Estate, 1048 Washington St. with treats for all the good little boys and ghouls. Trick or Treating is free! Annual event. Parade formation and start is at the Toms River Shopping Centre on the corner of Highland Parkway & Rt. 166 (Main St.).